Home › Adhesives & Dispensing › Cyanoacrylates Briefing: Part Two – Dispensing suggestions. We spoke recently about cyanoacrylates; their bonding characteristics, potential problems and solutions. Part two of our discussion reviews several methods of dispensing them. Make the correct choice based upon the material packaging and how it is to be dispensed. Since cyanoacrylate reacts with moisture and “metal-ions,” it is important to use dry compressed air (or nitrogen) and non-metallic wetted parts. Example: A PP300-GL-A fluid reservoir is a good solution, as the plastic bottle package containing the cyanoacrylate can be placed directly into the pressure reservoir, (30 PSI low cps fluid). 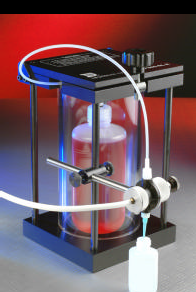 An advantage of using the PP300-GL-A is that the level of fluid can be monitored through the glass chamber. The pinch tube valve pictured provides an infinite degree of control for continuous micro-shot applications. Alternatively, a pinch-tube pen is a practical low-cost option for low-viscosity manual dispensing of cyanoacrylates and has a natural mechanical no-drip function with nothing to adjust. It’s particularly useful for applying beads of CA. When using wet compressed air, “blooming” may occur on the inside of the PP300-GL-A glass. Blooming is the reaction of the cyanoacrylate vapor with the water content in the air, resulting in crystallization of the cyanoacrylate on the inside wall of the glass chamber. The “blooming” residue can be easily cleaned with a solvent. ‹ Cyanoacrylate; Quick Breifing on “Instant” adhesives.